*This post contains affiliate links. This means that if you click them and purchase something, I will make money to support this blog at no additional cost to you. Thanks for supporting TPT! You know what I am seeing a lot of these days? Blog posts and magazine articles dedicated to the topic of self care. Articles and posts that are focusing on the fact that we need to take care of ourselves and make ourselves a priority. Technically, this idea could be taken too far if we aren't careful, but I am appreciate that people are realizing that in order to live life as the peculiar treasures we were meant to be, we have to invest in ourselves. We can't help others, give our all all of the time, and go-go-go constantly and expect to have a full life. Why? Because when we stop taking care of ourselves, there is quickly nothing left to give. And that's why having self-care rituals that we practice consistently is so important. Need some ideas on how to care for yourself? I've got your back! This winter, I have almost exclusively worn Bahama Mama by Essie. I absolutely love the color, and it is seriously one of the best nail polishes I've ever had. And for the Spring, I've been eyeing Where's My Chauffeur. So stinkin' pretty, right? I don't do this NEARLY enough. I always try to work on blog tasks and I never just lay in bed and read someone else's work. But I know that 1.) reading is relaxing and good for me, and 2.) I probably wouldn't struggle with writer's block as much if I took time to read. Reading also has a calming effect on many people. So if you have trouble calming down in the evenings, you may want to start reading before bed. There is one book in particular that I absolutely love but have been reading since last May 🙈. It's called Wild and Free, and I think that pretty much any woman in her 20's-30's would benefit from it. It's all about realizing who we were created to be- women who are free in Christ and free from shame. Seriously amazing! This is something I have done for many, many years. I love how it feels to sink down into a hot bath, the smell of bath salts, bombs, or bubbles filling the air. If I have bath salts, I like to combine them with a few of lavender essential oils and a tiny splash of organic, unfiltered apple cider vinegar. The vinegar has cleansing properties and is fantastic for your skin, the lavender is calming, and the bath salts help a tired and achy body. Sometimes I like to read a magazine (my favorites are Good Housekeeping, The Magnolia Journal, and Woman's Day). Sometimes I like to read a book or a chapter in the Bible. Sometimes I like to play Candy Crush and hope I don't drop my phone in the water. And sometimes, I like to close my eyes and listen to music, or nothing at all. There are so many different ways to relax and so many ways to practice self-care, but these are my three favorite ways and I love that none of them require technology. Sure, if you prefer, read on your kindle, turn on that music while you soak, or watch Netflix while you paint your nails. Nothing wrong with that at all. 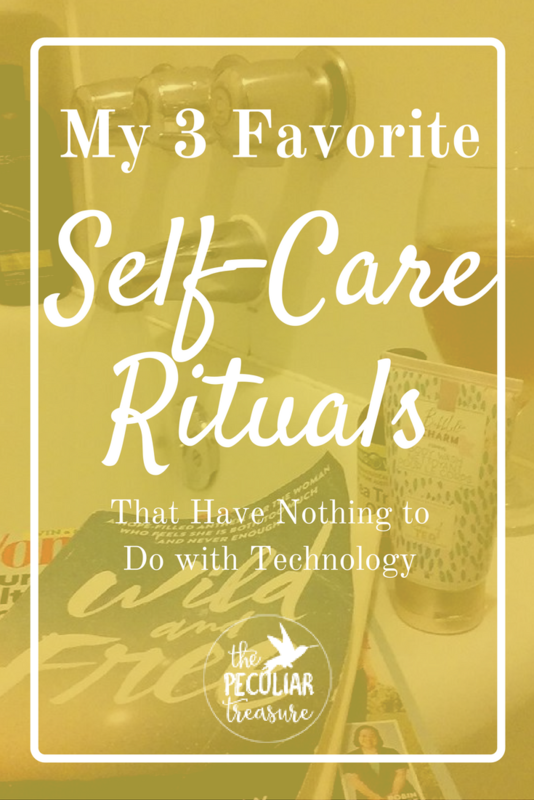 But if you need a break from technology, you are not excluded from these rituals! 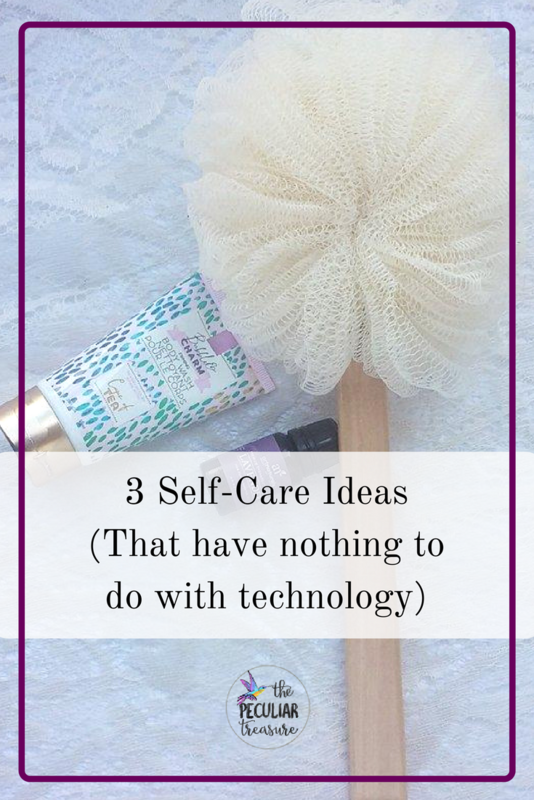 Do you have a favorite self-care ritual that I didn't include in this post? Tell us about it in the comments below! Painting my nails is one of my favorites, too! I paint my nails at least twice a week, haha. It's therapeutic! Love this! Self care is so important to keep going from day to day. I love to paint my nails. I don't get to do it as much with two babies in the house now and it usually take me several hours spread over a couple of days to finish two coats of polish and one clear top coat but when I do get it done I feel so much better. I also like to do some breathing exercises at night right before I fall asleep. It helps clear my head and almost feels like I am releasing the day's negativity when I exhale. Great post!! I love reading snuggled up in bed and I read in the bath. I read a lot of non-fiction books which is great but I'm making a point of reading a fiction book a month and I'm loving it. I've recently started an epsom-salt bath routine and it has changed my life lol...apparently magnesium relaxes your muscles and helps you sleep! I love these ideas. I love doing an at home pedicure some days. I've been taking evening baths DAILY lately! It's been so cold and the water is so warm and the lavender is so heavenly!! It's been a nice break from the typical screen time I usually have! Reading in general makes me so happy. Whenever I'm feeling overwhelmed, I grab a book and escape from my own world and read about someone else's. 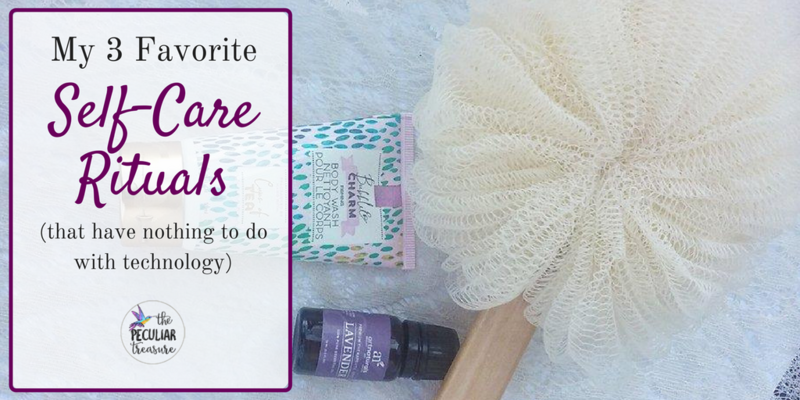 It's the perfect way to relax and unwind at the end of the day! Reading in bed will NEVER get old. Such a perfect way to relax! I remember the old say calgon take me away. A nice warm soak in a bubble bath while reading a good book is always a winner. I find reading soooo relaxing. I don't know how, but all these made me feel so cozy and relaxed. I would love to soak up in a hot tub right now. Great ways to step away from the screen (which inevitably can make you more depressed). I need a good spa day! Self care is so important. One of my goals is to spend more time doing what I call "active" self care. Instead of watching Netflix which is passive do some of what you mentioned. Take a bath etc. I haven't soaked in the tub in FOREVER, but I do love painting my nails for a self-care splurge! I don't soak in the tub (it has always seemed to gross me out lol) but I LOVE reading in bed and painting my nails. Love these! I haven't painted my nails in ages, but reading in bed is a huge one for me! I combine two of them. I read in the tub. It's so relaxing! I keep my phone in the bedroom and just spent the time relaxing. Love reading in bed and having a bath at night - perfect for relaxing and getting ready for bed time! Love #2 and #3. Baths are truly a little piece of heaven I think!